Adventures in the Andes continue! 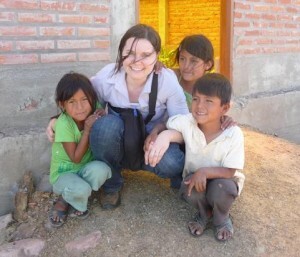 CFTC Program Manager Genevieve is on day four of her first monitoring visit to Bolivia and she has had many very inspiring conversations with the people of some of Bolivia’s most remote and impoverished communities. Genevieve has met many parents on this visit – parents who are strongly motivated to achieve change for their children despite the difficult circumstances they face day to day. CFTC Bolivian partner, IPTK, has been engaging these parents to ensure that their voices are being heard and that they are involved in achieving the outcomes we all desire: better health and education for children in Bolivia. Children in a K'acha K'acha schoolyard. 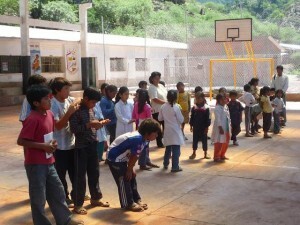 Feb 10, 2012, K’acha K’acha, Bolivia–It is day four and already we have visited four of the five communities that are expecting us. The sun is strong, the roads are rough, and we’ve been going non-stop, but the plain and simple desire to improve the health and education of their children among the parents we’ve spoken with has kept me going. In the community of K’acha K’acha, a mother (who also heads the parents’ committee at the school) spoke to us about what it means to her to have improved educational and health support: “When I was growing up in this community, we didn’t have these kinds of resources, but now my children have a brighter future.” Another community leader spoke about the opportunity for kids to dream bigger now that they are receiving more support. 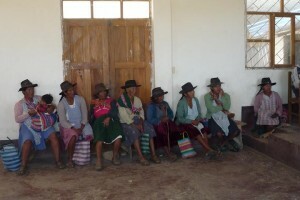 The women of Sonqochipa have been involved in project design from its inception. Their buy-in and 'ownership' is critical to its success. That support has come from increased national commitments to provide more health personnel and teachers. And it has also come from generous CFTC donors who are funding infrastructure improvements and early childhood development in collaboration with CFTC’s partner, IPTK, and local Bolivian government. 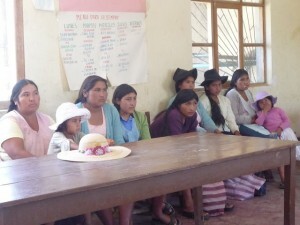 In Sonqochipa, we met with a women’s group with whom IPTK is working on income-generating projects. Currently, the children in this community go wherever their mothers go. This means that they are at work with their mothers–at market, at workplaces of all types. Not only are many of these workplaces dangerous to children, the children are not receiving the attention that they need during the day – and their mothers are unable to produce as much as they would like because they are, at the same time, trying to look after their children. Women of Sojta Pata. These women's lives - and those of their children - will dramatically change with an early childhood development centre. This group of women made it clear that an early childhood development program would provide the learning and nutritional support for their children that they are challenged to provide, while allowing them the ability to generate more income and better parent their children over the long term. Sojta Pata is the most remote of the communities we visited, about two hours on unpaved mountain roads outside of the city of Sucre. As a result, it’s one of the most under-served communities as well. These children in Qhora Qhora are among those with a better chance to grow up w up literate and safe. Over the past week in Bolivia, I have seen great need, but I have also seen great enthusiasm and engagement driven by parents’ dedication to improve the health and education of their children. None of CFTC’s work with children in these communities can succeed without the direct involvement and long-term engagement of parents. These parents have been involved in the project’s design since the beginning and they are also the key to its sustainable and long-term success. I continue to feel very inspired by the focus of our work and the support of our donors. Back soon with a final post!